The confirmation of Brett Kavanaugh changes the composition of the US Supreme Court and has revived discussions about how political the selection is. The debate is unlike any the UK has when justices at the Supreme Court are replaced, as a different appointment system means their political views are rarely publicly known and, according to experts, do not have any influence in the process. In the US, the nine-member Supreme Court is the third branch of the federal government and its decisions have a profound impact on American society. It is often the final word on highly contentious laws, disputes between state and federal governments, and final appeals to stay executions. Under Article 2 of the constitution, the president has the power to make a nomination. "There's no clear view as to why the president was granted this power," said Bruce Ackerman, Sterling Professor of Law at Yale University. The Senate has the task to approve a candidate, in usually tense hearings, a method that enforces the concept of checks and balances between the powers envisioned by the Founding Fathers. Candidates do not have to meet any qualifications and serve lifetime terms - a contentious topic for many. That is why replacing a justice is one of the most consequential decisions of a president. So, unsurprisingly, every nomination is a highly politicised affair. Divisions at the top court are not new, as presidents tend to nominate people with the same ideological positions, but scholars say there was little evidence of partisan division until recently. Dissent in the past was infrequent and, when it happened, did not tend to break along party lines, Prof Neal Devins and Prof Lawrence Baum wrote in How Party Polarization Turned the Supreme Court into a Partisan Court. Take the Dred Scott v Sandford case, in which the court declared in 1857 that slaves were not US citizens and could not sue in federal courts. The two diverging votes in one of the most important decisions of that time came from judges who had been appointed by both the Whig and Democratic parties. The lack of partisan divide remained over the following decades but signs of divisions started to emerge. Byron White was the last conservative-leaning nomination by a Democrat - President John F Kennedy in 1962 - while David Souter was the last liberal-leaning justice appointed by a Republican president - George H W Bush in 1990. 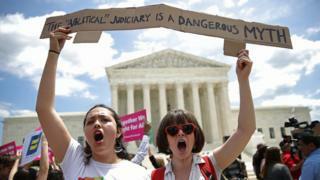 US Supreme Court: Who are the justices? Things changed in 2010, with the retirement of John Paul Stevens, a liberal justice appointed by Republican President Gerald Ford in 1975. Since then, all of the nominations by Democrats have been liberal while all those appointed by Republicans are conservative, the first time in the court's history that ideological positions coincide with party lines, Prof Devins and Prof Baum wrote. "Today's partisan split, while unprecedented, is likely enduring." The partial exception, they said, was Justice Anthony Kennedy, a Republican appointee who sided with liberal justices on key issues like abortion, death penalty and gay rights, and has now retired. Now that Brett Kavanaugh, who by all accounts is a reliable conservative, has been confirmed as Mr Kennedy's replacement, he is expected to push the court to the right, restoring a conservative majority of 5-4. And being relatively young, 53 years old, he is likely to be there for many years. That is one of the reasons why his nomination has an even bigger significance. Analysts say Mr Kavanaugh's nomination hearings, which included a row over documents related to his years in the George W Bush administration that were shielded from Senate Democrats and the public as well as allegations of sexual misconduct that he denied, have been the most contentious in recent history, and highlighted how partisan divisions can dominate the process. Writing in the Stanford Law Review Online in 2012, Eric Hamilton said: "Politicisation of the Supreme Court causes the American public to lose faith in the Court". In the UK, the 12-member Supreme Court was created in 2009, replacing the Law Lords in Parliament, bringing the UK into line with many comparable modern states. It acts as a final court of appeal in cases of major public importance. The justices are nominated by an independent commission, chaired by the president of the court, a senior judge from anywhere in the UK to be named by the president and members of the appointment commissions from England and Wales, Scotland and Northern Ireland. A number of senior judges must be consulted by the commission before any decision is taken. Candidates must have been a senior judge for at least two years or a qualified lawyer for at least 15. When someone is chosen, the name is sent to the justice secretary, who can accept or reject it. If accepted, the nomination is then sent to the prime minister, who recommends it to the Queen, who makes the appointment. These rules, experts say, mean that political positions of nominees are often unknown or irrelevant in the process. "[Changes were not] very controversial at all. There was no discussion of it in the press when the names were announced and when we looked at the people who were there it was all understandable," said Alison Young, Prof of Public Law at the University of Cambridge. "We have a completely independent process... It's almost seen like an internal promotion system rather than a politicised process," she added, saying that citizens can officially complain over alleged political bias. Another difference is that the UK has no codified, written constitution, so the court does not have the ability to strike down a law as unconstitutional, unlike in the US, where the court has also been involved in key political decisions. In 1997, in a case involving then President Bill Clinton, the US Supreme Court ruled that sitting US presidents could be prosecuted. In 1974, it ordered President Richard Nixon to deliver tape recordings related to the Watergate scandal. For life or not for life? There is no limit to UK justices' terms but they must retire when they are 75 years old. Similar age restrictions are in place in other Western European countries too. Lifetime appointments in the US were originally designed to isolate them from political pressure. But given the current climate, critics argue that, in fact, the opposite is happening and some have defended the introduction of fixed terms. "It doesn't make sense at all," said Prof Ackerman, from Yale, about lifetime terms. And so, members nominated at a relatively young age - Justice Clarence Thomas, another controversial nomination, was 43 when he was appointed in 1991 - can serve for several decades. Opponents to terms, meanwhile, say they could actually make the politicisation even worse, as presidents would be more inclined to make partisan nominations as justices would have temporary terms.